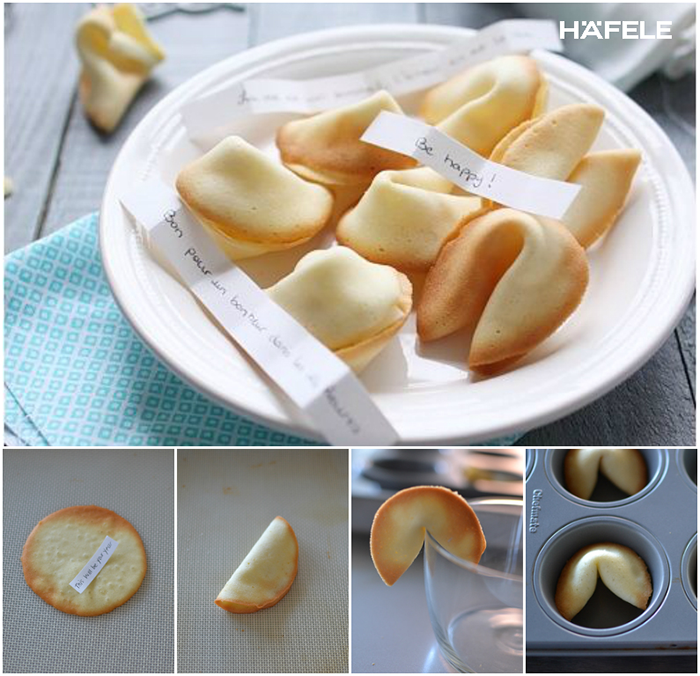 For the Women’s Day on 8 March, sending wishes wrapped in lovely fortune cookies will surprise and delight your beloved women. Let Häfele inspire the way you appreciate them. Stir egg whites and sugar on high speed of an electric mixer until frothy, then stir this in melted butter and vanill. Preheat the oven and prepare a baking tray (can use silicon pads or stencils onto the surface of baking tray) and to prevent sticking, spread one layer of butter. Pour a spoonful of dough onto trays, very thin frame (if it is so thick, the cookie won’t be crispy) and bake for 8-10 minutes. Bake until the cookies begin to brown slightly, quickly take them out, fold in half. Then put the cookies into small cups or muffin pans to shape when it cooled. Do the same with the remaining cookies. Remember do this quickly and done when the cookies is still hot asthey can be easily shaped then. ** You can dip the cookies into melting chocolate or sprinkle with the nuts to make them more attractive!